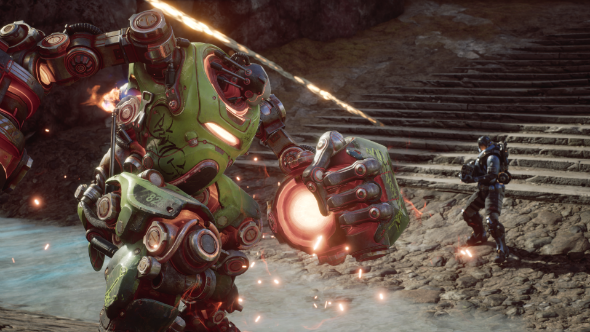 Paragon, Epic’s third-person MOBA with a thirst for heights, is upheaving almost everything about the game in its Monolith update due out tomorrow. On top of a new map, 30% smaller than the Legacy battleground, every aspect of the 5v5 multiplayer is being reworked down to the calculations it runs on. For other free PC games to sink your teeth and not your wallet into, check these out. MOBAs are no stranger to change, in fact it’s the one genre where reinventing your game every few months is a hotly anticipated event among players rather than a sign of design gone wrong. But in Paragon’s case, there’s heavy doses of both. 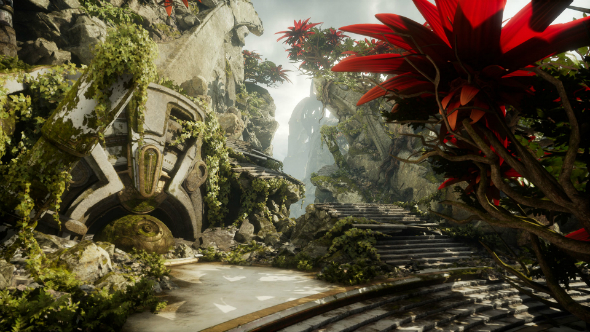 To find out more about why Monolith was needed to create the game they want and stop the game they didn’t, we talked to Epic’s lead hero designer Cameron Winston about renovating Agora. The old map’s size spawned all sorts of problems without solving many others. It was huge, and getting a minion wave from one end to the other in the later stages of the game, attempting to capitalise on the death timers of the other team, could end up taking so long that they would respawn just as you arrived at their base. Even without escorting creeps down a lane, getting around took forever, which is why the team added Travel Mode – a way to sprint about when out of combat with the danger of being rooted if you are hit while running. But even that beget its own issues. This ‘degenerate gameplay’ involved players teaming up to leap-frog an opponent, with one in travel mode constantly able to catch up to and deal damage to an enemy being kept out of travel mode by a partner. It repurposed the mechanic from a traversal tool to a fighting mechanic and, well, felt terrible. Among the internal ‘competitive QA team’ at Epic, metas evolved which positioned Grux, a tough melee fighter, as a support for the mid lane. Grux would stand there, just to the side of the lane, in full view but in travel mode and wait for the enemy mid to go in for a last hit. As soon as they fired their attack, they were unable to prevent him from jumping them at which point the enemy mid either uses their teleport to escape and foregoes last hits, or they die. 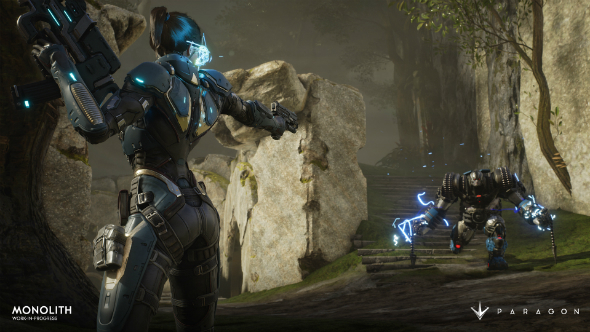 The last we spoke to the Paragon team, they were already attempting to fix travel mode. Having been alerted to its dangers by the competitive QA team last year in November, the public were just beginning to notice the same exploitations in April prompting the team to talk about what solutions they were proposing. None of them have survived to implementation because they were all posing fixes in the context of the old map. 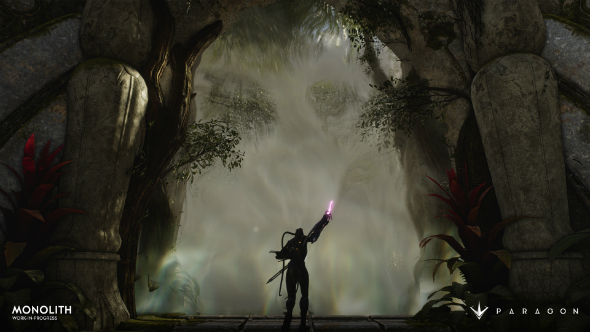 Other proposed solutions that now find their root completely absent in Monolith include a way of allowing jungle Shadow Pads (now completely removed from the game and replaced by Dark Souls-esque doorways of fog) to give players moving between lanes a speed boost, creating a specific path to follow through the winding glades for efficient travel. But, of course, there are reasons you can’t have nice things. While this team of 12 to 13 extremely skilled players hammering the game for ten hours a day is enough to rapidly seek out the ruts evolving metas eventually sink into, they’re not best placed to advise on the early user experience, something Winston recognises is also at fault with Paragon. Auto-buy, introduced in this update, takes the reigns of quite a complex part of the game away from the player but still lets them know it’s holding them. Leaving base you’re told what your earned card points have been spent on, and if you open the shop it’ll tell you what to expect from your next deposit when you return for healing or death. All of Monolith’s changes are designed to put you in the action, avoiding falling down the long warren-like rabbit holes of worrying about builds too much, though they offer an edge at higher skill play. This extends deep into the game’s own code, with the calculations used by the game getting their own overhaul leading to new avenues for hero reworks. 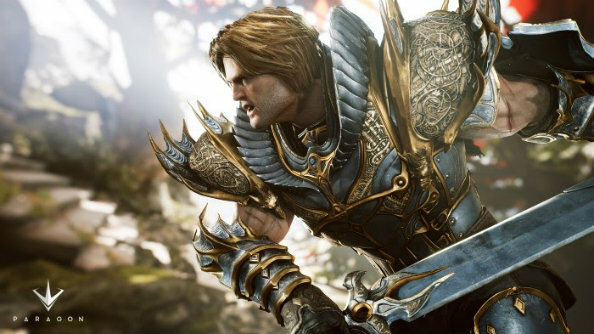 However a select few heroes have also their kits rethought, including Greystone, Sevarog and Twinblast. “Twinblast has been aching for a rework forever, his original kit design was not something that was we could either have it be balanced or fun, but when it was fun it wasn’t balanced and when it’s balanced he isn’t fun,” Winston said. “He had too many toys; an engage, a disengage and a slow, so he could kite you on both ends of an engagement and philosophically you don’t want a carry that can both slow you and disengage from you. Those two things together are very powerful and make the character a little bit too good. This desire to cater Paragon outside of the MOBA set is one that has bitten them before. The Legacy map and mechanics eventually fell prey to exploits discovered by those from other MOBA backgrounds while Epic attempted to leave it open for those unfamiliar with lane roles and rotations. Monolith is a step closer along the sliding scale of team shooter to MOBA, but perhaps onto firmer ground.